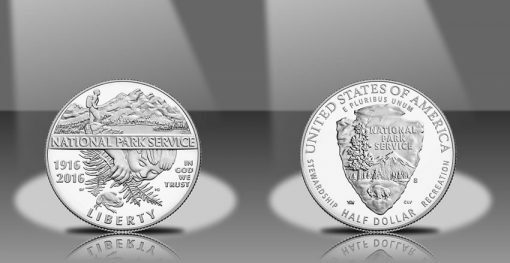 At noon ET today, March 24, the United States Mint will accept orders for $5 gold, $1 silver and 50c clad coins celebrating the 100th Anniversary of the National Park Service (NPS). 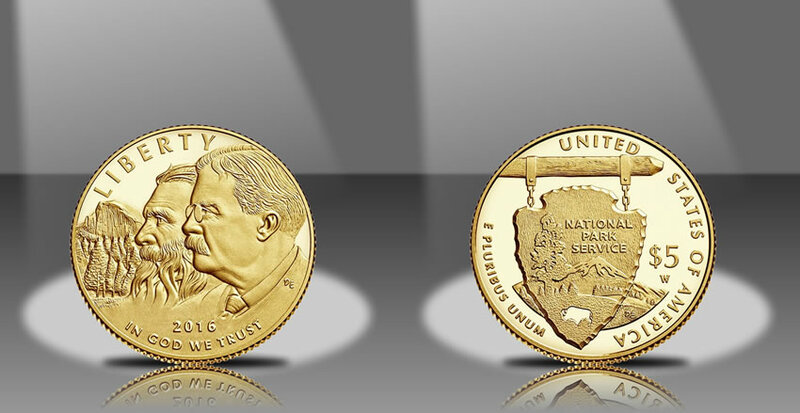 National Park Service Commemorative Coins in silver, gold and clad (obverse sides) honoring the agency’s founding. From 1916 to the present, the NPS has grown from 37 park units with 6,000,000 acres of land in the western United States to more than 400 units with 84,000,000 acres of land in nearly all States and territories. Pricing of the new collectible products range from $20.95 to $466.45, across seven different options. This includes a three-coin proof set and six individual coins in collector qualities of proof and uncirculated. Final design selections for the 2016 National Park Service Commemorative Coins were unveiled in November 2015 at a ceremony held at the U.S. Department of the Interior in Washington, DC. The Department of the Interior oversees the National Park Service, which was created in 1916 and today oversees more than 400 parks throughout the United States and its territories. Images of the coins were then published in December. United States Mint Sculptor-Engraver Don Everhart designed and sculpted the obverse (heads side) image found on the $5 National Park Service Gold Coin. It features side profile portraits of John Muir and Theodore Roosevelt, two individuals most closely associated with the creation of the national park system. Inscriptions include LIBERTY, 2016, and IN GOD WE TRUST. The reverse (tails side) offers the NPS logo along with the inscriptions of UNITED STATES OF AMERICA, E PLURIBUS UNUM, and $5. Don Everhart also designed and sculpted the reverse. 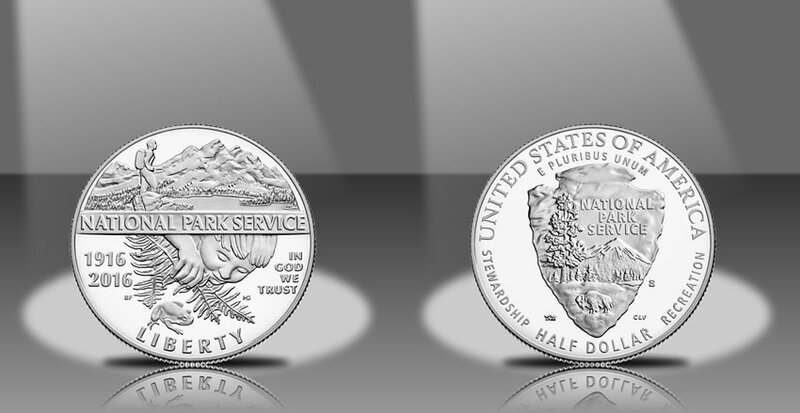 One of the park service’s most iconic features is showcased on the obverse of the commemorative silver dollar. Yellowstone National Park’s Old Faithful geyser is seen along with a buffalo. LIBERTY, NATIONAL PARK SERVICE CENTENNIAL, IN GOD WE TRUST, and 1916-2016 complete the design which was created and sculpted by United States Mint Sculptor-Engraver Joseph Menna. A Latina Folklórico dancer is found on the reverse of the $1 coin to signify the multi-cultural experiences available within the park system. The NPS logo is also a part of the design with HERITAGE, CULTURE, and PRIDE joining the standard inscriptions of UNITED STATES OF AMERICA, E PLURIBUS UNUM, and $1. The reverse was designed by Artistic Infusion Program (AIP) artist Chris Costello and sculpted by United States Mint Sculptor-Engraver Jim Licaretz. AIP artist Barbara Fox designed the obverse of the 50c coin with sculpting by United States Mint Sculptor-Engraver Michael Gaudioso. Celebrating the diversity and breadth of the NPS system, it showcases a hiker discovering the majesty of the wilderness and a small child discovering a frog hiding in ferns. Inscriptions include LIBERTY, 2016, IN GOD WE TRUST, 1916, and NATIONAL PARK SERVICE. The reverse depicts the NPS logo along with the inscriptions of UNITED STATES OF AMERICA, E PLURIBUS UNUM, HALF DOLLAR, STEWARDSHIP, and RECREATION. This design was created by AIP artist Thomas Hipschen and sculpted by United States Mint Sculptor-Engraver Charles L. Vickers. 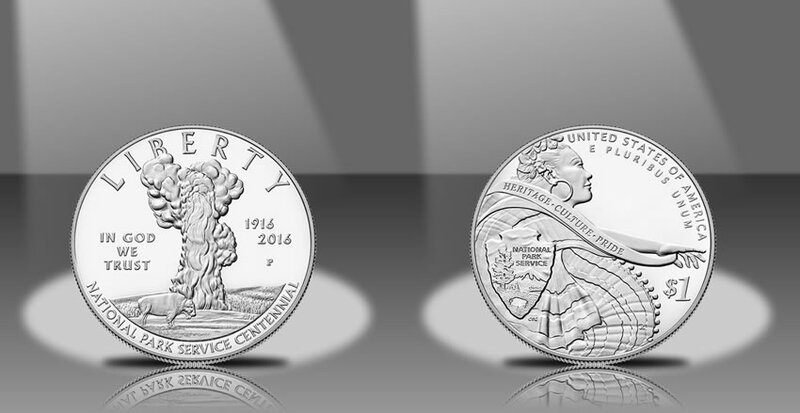 All four United States Mint production facilities participated in making the NPS commemorative coins. The $5 gold coins are from the West Point Mint (denoted with a ‘W’ mintmark), the silver dollars are from Philadelphia (P), the uncirculated half-dollar is from Denver (D) and the proof half-dollar is from San Francisco (S). Introductory pricing ends on April 25, 2016, at 3 p.m. ET. Orders placed after that time will be at regular pricing. Pricing for the gold coins and the three coin-set may vary each week based on fluctuations in the gold market. The silver and clad commemorative pricing will remain as shown in the chart above. As mandated by their authorizing law, surcharge amounts of $35 for each gold coin, $10 for each silver dollar, and $5 for each half-dollar are included in the above pricing. Funds collected are to be used to preserve and protect resources under the stewardship of the NPS and promote public enjoyment and appreciation of these resources. Orders are also accepted at 1-800-USA-MINT (872-6468). Hearing and speech-impaired customers with TTY equipment may order at 1-888-321-MINT. The coins were authorized by Congress under Public Law 113-291. Ordering of the Three-Coin set at 12:01PM was flawless. Limit of two (2) on the Three-Coin Set. Let’s see the number of dealers who will have 10, 20 or 50 sets to sell. I noticed that 2 set per household limit on the 3-coin Proof NPS sets up to the limit of 15,000 sets in the e-mail they sent me. I bet our HSN friend/fiend Mr. Mezack will be hawking them this Easter Holiday weekend just in time to ripoff unsuspecting channel servers! Happy collecting Mr. Williams! Glad you got a set. Christopher: Cool. I just ordered two $5 proofs, also with zero problems. Seth, Christopher: OK, confession time. I’m ambivalent about the design and probably wouldn’t have bought them for myself. However two family members work for NPS so the coins should make nice b’day gifts … plus at that price, I oughtta get a pass till the next decade! I know the Three-Coin Set is pricey, but with a mintage of only 15,000, I thought they would be sold out by now (5PM EST). Too cool! What a nice guy you.are! I work for the NPS too & my birthday is soon… Lol. I have collected coins & other numismatic items for 40 years since age 10 & my nice family members never bought me a coin & when I got the nerve to ask why a few years ago they said I had too much ! Lol Even King Tut didn’t have “too much” gold & he really did take it all with him until 1922 at least. My 4 nephews get my collection when I go to wherever Tut is now. I too thought the 15,000 sets would be a quick sellout (especially since they put a 2-set per household limit on them). I’m sure Mike “Sold Out, Limited Edition” Mezack will breathlessly tell his audience how to “hunt down” his sets for the show.